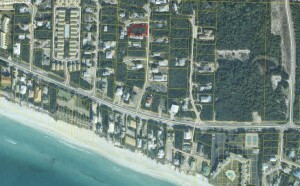 Lot for sale in Seacrest Beach just listed! Located just 1/2 mile from Alys Beach and 1 mile from Rosemary Beach, this lot has no build out time, no HOA dues, and is a short walk away to the deeded beach access. This Seacrest lot can easily accommodate a home, carriage home, and a pool. Don’t miss your opportunity to build your perfect beach home!